The Bus Services Bill is currently being debated by the UK parliament and if successful will become law by May 2017 – in England only. But what does it mean for the future of Bus Services, particularly in rural areas? The Department for Transport has issued a summary document that explains how it is intended to work in practice. It points out that buses are England’s most used form of public transport accounting for over 60% of all public transport trips, and with over 4.65 billion passenger journeys completed in 2014/15. Since 2004/05, bus use in England outside London has only increased by 2% whereas it has grown dramatically in London, rising by 31% since 2004/05. Central Government sees that its role is to provide local authorities and bus operators with the tools they need to improve local bus services and get more people on to buses. So it aims that the Bill will expand the range of tools available by introducing new powers and improving the approaches that are currently available. New Enhanced Partnership powers will enable local authorities to work with bus operators to set a vision for bus services in their area and a plan to help achieve those improvements. Note: The House of Lords widened the franchising powers to all local transport authorities not just Mayoral combined authorities. It remains to be seen whether the House of Commons will accept or reject this amendment to the Bill. (14 October 2016). These new powers will make it easier for passengers to use buses and to access timetables, fares, routes, the location of services and the arrival time of services. By integrating this new approach with bus registration it will strip out duplication and streamline processes. get information about passenger numbers and the revenue of a service that an operator intends to cancel or has cancelled. give this information to potential bidders if the authority decides to support the service that has been cancelled. This will make sure there is a level playing field for bidders and help local authorities take better decisions on whether or not to support services. The Bill also exempts rail replacement bus services procured by train operating companies from bus service registration requirements, recognising that these services are often provided at short notice, and for limited periods of time. The Bill also aims to support Devolution deals – signed with local authorities across the country – that allow for local decisions to be taken to drive growth, investment and improve services for local people. Mayors and local authorities will be free to determine the best way of improving bus services for local people. The draft guidance recognises the challenges related to rural buses services. In deciding how to support rural bus services, or when considering the impact of potential policy choices on rural areas, it recommends that local authorities should undertake a rural proofing exercise. Under a franchising scheme local authorities can design the procurement process in a way that makes the most out of the existing resources. This could, for example, involve packaging some less profitable routes in rural areas together with those which are likely to be more commercially viable, but it will be down to each authority to determine the most effective way of delivering the local services. The draft guidance says franchising could also be used by an authority to help balance-out the provision of services across the area, potentially diverting some services from more urban areas, where the authority may consider that there is over-provision of services, to rural areas. The draft guidance tends to suggest that the partnership provisions of the Bill will enable local authorities and bus operators to mutually work together to deliver improvements to local bus services. The Draft Guidance also strongly recommends that local authorities consider the opportunities offered by encouraging the local community transport sector and through the application of Total Transport principles. In addition, the Draft Guidance considers that in rural areas particularly, feeder services and interchange with this sort of transport and ‘mainstream’ local bus services can play a part in maintaining and developing effective and viable rural public transport services. There is potential, for example, for a public-sector funded demand responsive service to carry passengers from a series of villages to a bus stop or interchange where they could use a commercial local bus service to complete their journey, say, into the centre of a market town. It considers that this arrangement has the potential to keep the running costs of the demand responsive service down as well as helping to maintain the commercial viability of the connecting commercial local bus service. The draft guidance also encourages transport authorities to consider improving air quality and emissions standards when developing a franchising proposal or a partnership scheme. The Department of Transport is fully supportive of the principle of all drivers being trained in disability awareness and the majority already receive such training as part of their Certificate of Professional Competence. The draft guidance asks authorities commissioning public services should think about whether the services they are going to buy, or the way they are going to buy them, could secure these benefits for their area and for local people. It also encourages those who commission public services to talk to their local providers and communities to design better services, with the aim of finding new and innovative solutions to difficult problems. The basic augment for, initially only allowing mayoral combined authorities to run franchises, appears to be that a “Transport Authority” needs to be large enough be able to be effectively put in place and already have responsibility for the majority of services needed to effectively operate a service – with one person (like a Mayor) with overall responsibility. 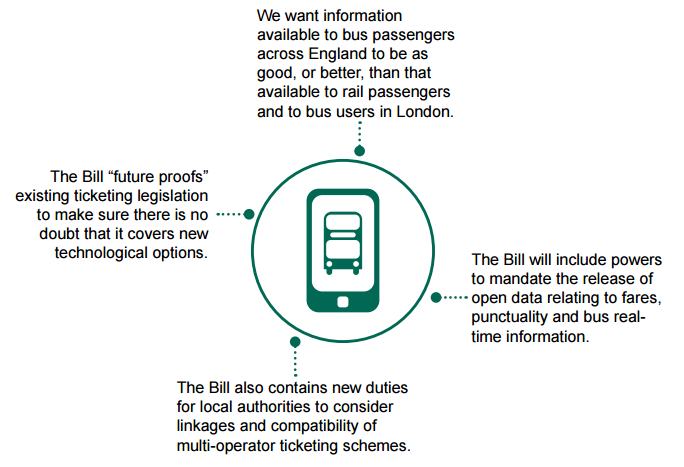 Bus Services Bill – a new era for UK’s Bus Services? It seems that becoming a franchised transport authority is likely to be most beneficial for rural areas, as it will enable the transport authority to include less economically viable areas as part of a larger bus service franchise. The enhanced partnership option – will tend to relay upon the co-operation of commercial companies to find a solution to meet the needs of more rural areas. This tends to have been the current situation since de-regulation in 1985 and there is plenty of evidence to show that it has not worked. The Bus Services Bill is actively encouraging integrated transport provision, yet when it comes to the “last mile” in rural areas it appears to suggest that this can be left to local organisations running Community Transport services. Is it not the responsibility of a franchising Transport Authority as part of its rural proofing exercise to also consider the “last mile”? In addition, there should be more specific reference of the impact on congestion that rural car travellers will have when reaching urban areas. Reducing the need to travel by car in a rural area, by having access to a rapid method of travel to an urban area is equally important. There should be more specific reference to “last mile” community transport type services and their interchange with railway, busway or tramway stations. This should involve bringing taxi-bus and train-taxi services under the remit of a Franchising Transport Authority. Tourism opportunities within a local community should be considered “as benefits to the local area” – when planning bus services. It’s not just about “outward” and return journeys from a local community, it is also about “inward” and return journeys that could increase visitors (tourists) and boost the economy the local area as well as reduce “rural congestion” in rural visitor “hotspots” – particularly at weekends.